I'm in the wings of our next move. It has felt different than the previous moves, something has told me that it won't go as quickly. I want to fight against this lack of urgency that everyone else seems to exhibit. Someone in HR was on vacation, a realtor didn't respond to an email promptly, and now we are still waiting to get the house listed. Mark has moved forward to start his new job, and I've stayed behind to tie up the loose ends here. There's a different rhythm to this dance, and we aren't quite dancing in sync. It isn't causing conflict, it's more like speaking different languages. Still, I sense God at work, His hands directing each movement. So I'll sit on my hands and practice patience, believing there's a purpose for all the delays. Perhaps our buyer hasn't got the memo yet. Perhaps the house we will make our next home hasn't yet been listed. No matter the reason, you can't hurry the clock, or the calendar, or God. He ultimately keeps time perfectly. 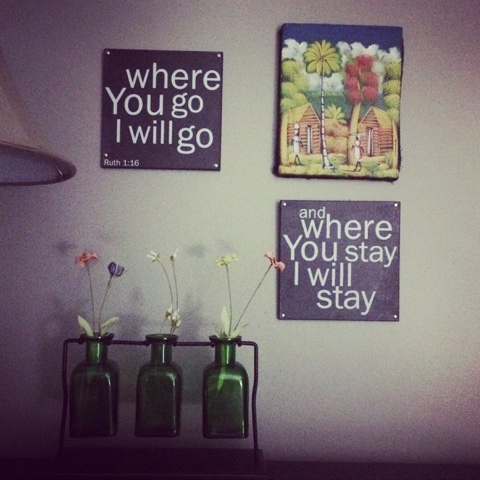 This verse is above a dresser in our bedroom, a constant reminder of our wedding vows made over 31 years ago. When we got married, I never expected to move away from our beach community family and fellowship, yet each move has had blessings and lessons I could not of learned if we had stayed in that first 2 bedroom 1 bath apartment in Huntington Beach. So many moves since then. 5 states, 2 of them twice! A move, on average, of every 3 years. So many boxes, addresses, zip codes... but love trumps them all, and I wouldn't of skipped a single one, not even these "move every year" years. I'm curious about this next move, not only where will we live, but where will we fellowship? Will I work outside the home? Will Mark work weekends? Underlying it all is this question: Will we move again in a year? This is the 3rd August in a row that we are in some stage of moving. Will it happen again next year? I need God's resilience to do this now, and I'll need Him all the more for the next move, whenever it will be. I'm grateful for His provisions, how He stirs others to pray for me (us) at the times we need it most. I'm thankful that He knows every detail, cares about every little notion. He is a God of details, and He knows every little one. He makes all of it good. He is good.